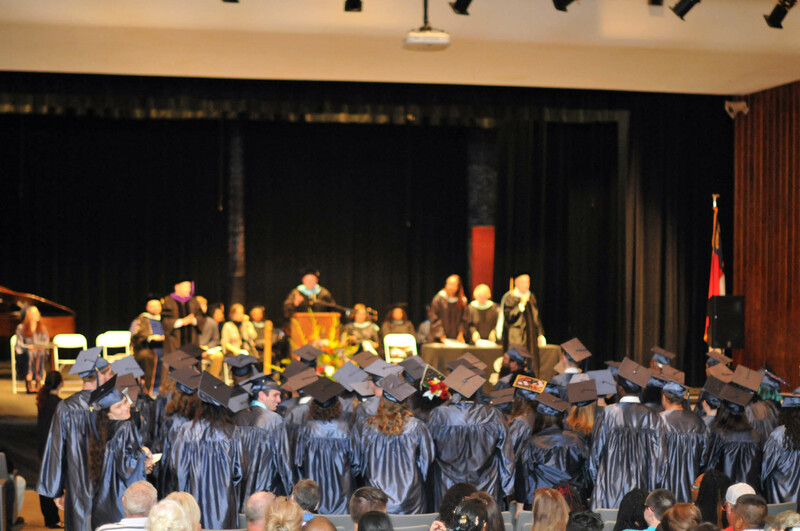 SANFORD - Central Carolina Community College's College and Career Readiness Commencement Exercises was held June 20 at Lee County High School's McLeod Auditorium, honoring the achievements of more than 135 students. Dr. Brian S. Merritt, CCCC Vice President of Student Learning/Chief Academic Officer, welcomed the audience. Sara Lambert, CCCC Interim College and Career Coordinator in Chatham County, introduced the commencement student speaker. Student Speaker Ronda Goldston, of Chatham County, said, "In the 11th grade, I was asked to write a paper about what I wanted to be when I grew up. What was my response? I wanted to be a good mother, because at 16 I was pregnant with my first daughter ... So when I had her, I tried to be the best mother I could be and made the difficult decision to leave school without getting my diploma. I promised myself I would go back eventually, but life happened and I had to be an adult. I was busy raising my children and working, so I kept putting it off and never went back -- but I never felt complete or good enough. "So I finally decided to get my GED. I started and I quit! But in 2017, I went back again more committed than before and this time I didn't quit! It wasn't easy working and going to school, or being in class with people half your age ... But in May of 2018, I finally passed my last test after much prayer, work, and support from the best support team ever! "I am truly thankful to CCCC and the instructors at the Siler City Center for never giving up on me. And lastly, I want everyone to know it's never too late and the process to improvement is and should be a lifelong journey. So if you have something on your heart that you want and need to complete, be like Nike and -- Just do it!" 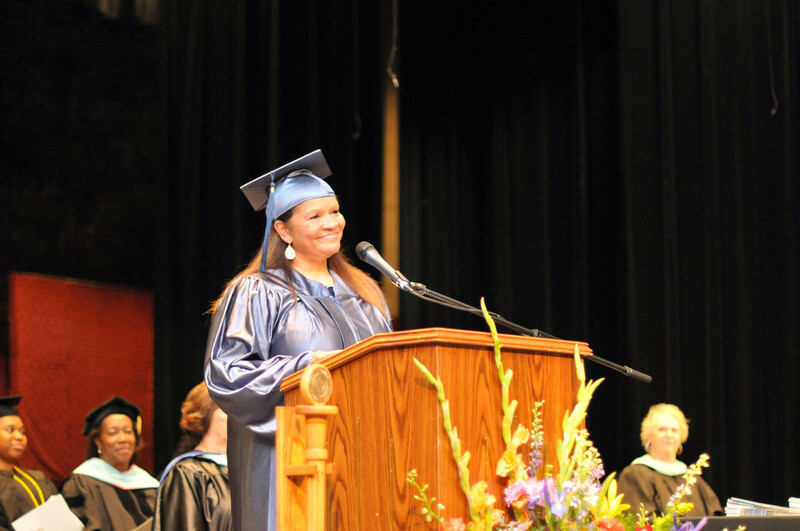 Sandra M. Thompson, CCCC Associate Dean of College and Career Readiness, recognized the honor graduates. Several students received CCCC Foundation scholarships to continue their education. The students are Samantha Lynn Lunsford, Claire McDonald, Derrick McLeod, and Matthew Noel. Devontre M. Farrar was recipient of the W.B. Wicker Memorial Scholarship. Daniel Loges, CCCC College and Career Readiness Coordinator in Lee County, introduced the candidates for graduation, who each received congratulations from Dr. T.E. Marchant, CCCC President, and Julian Philpott, Chairman of the CCCC Board of Trustees. Following the commencement exercises, family and friends celebrated with the graduates. For more information about Central Carolina Community College's College and Career Readiness programs, visit www.cccc.edu or contact: in Chatham County - 919-545-8663, in Harnett County - 910-814-8971, or in Lee County - 919-777-7701. Central Carolina Community College's College and Career Readiness Commencement Exercises was held June 20 at Lee County High School's McLeod Auditorium, honoring the achievements of more than 135 students. Ronda Goldston was the commencement student speaker at Central Carolina Community College's College and Career Readiness Commencement Exercises on June 20.